Sometimes you just need a small treat to warm you on a dreary day. On a whim the other day, I wanted some White Hot Chocolate, a treat I haven’t had in many years. It was cold and dreary outside and when I came in, all I wanted to do was to snuggle up beside the woodstove with a hot cuppa. It probably had to do with all of the white chocolate yumminess I’ve seen come out of the blogosphere this Christmas season. So I pulled out the cocoa butter and threw this together. We were all very happy with the results and it’s nice to have an option of something other than hot chocolate. Cocoa butter melts easily under 100 degrees, so you only need to bring this up to serving temperature to get it to melt. No worries about boiling. I like this as a change of pace because it doesn’t require the whisking that hot chocolate does because you don’t have to worry about little cocoa powder clumpies. In a saucepan, combine the coconut cream, cocoa butter, salt and honey. Heat, whisking regularly, until it reaches serving temperature and the cocoa butter has melted. 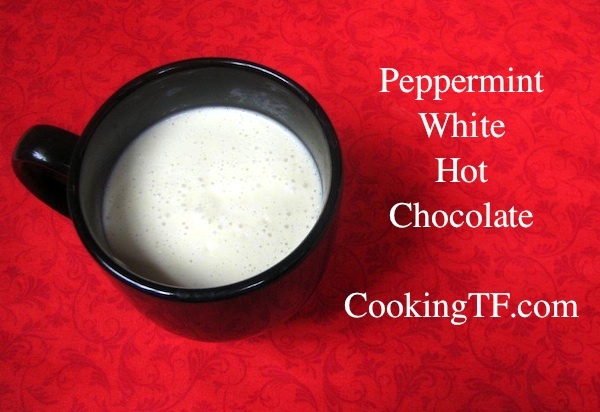 Remove from the heat, stir in the peppermint extract and serve immediately.